College Hill Yoga is an Iyengar Yoga program. Aaron Fleming, a certified Iyengar Yoga instructor, is the program director. Iyengar Yoga is a form of Hatha Yoga created by the late B.K.S. Iyengar. This method of yoga helps develop greater self-awareness by encouraging students to practice with precision and integrate the subtleties of body, breath, and mind into their postures. Beginners welcomed! 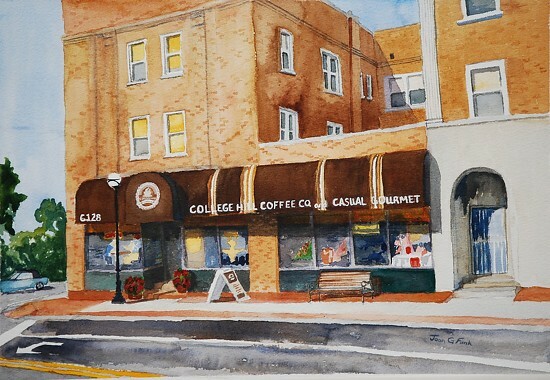 College Hill Neighborhood HUB program. At the College Hill Presbyterian Church. Help Us Become Integrated into the community; Aware of jobs in the community; Proficient in job skills through volunteer work; Independent in our living skills; Involved in community events. … I am your “Neighborhood Realtor®” for College Hill and the surrounding areas. Exit Realty is one of the fastest growing Real Estate companies in the country and I will utilize their proven technology to assist in buying and selling your home. Give me a call today! Full menu carry out and delivery. Serving College Hill for almost 50 years! Silk Road Textiles is a premier retailer of ethically-traded fine fabrics and yarn from around the world. Silk Road Textiles offers supplies and classes for fiber artists, quilters, knitters and garment makers of all levels. We also carry locally hand crafted gifts and products. Our specialties are the beautiful, the exotic, the unusual, and the fun. Surprises await you. Talbert House is a community-wide nonprofit that operates within five service lines: Adult Behavioral Health, Community Care, Court and Corrections, Housing, and Youth Behavioral Health. Children, adults and families benefit from these proven services. The Talbert House mission has two basic purposes: to improve social behavior and enhance personal recovery and growth.